Yep, this is another SWToR post/rant, only this time it’s about a problem I am having or ran into after the latest patch, the United Forces (hardware consolidation) update. I mention the hardware consolidation part because that’s really where this problem started. You see, SWToR was originally spread out over many servers, each one a duplicate of the others. You had X number of character slots on a server, and then you could go to a different server and make more. This meant that you could really have lots of toons, they were just spread out over however many servers you played on. 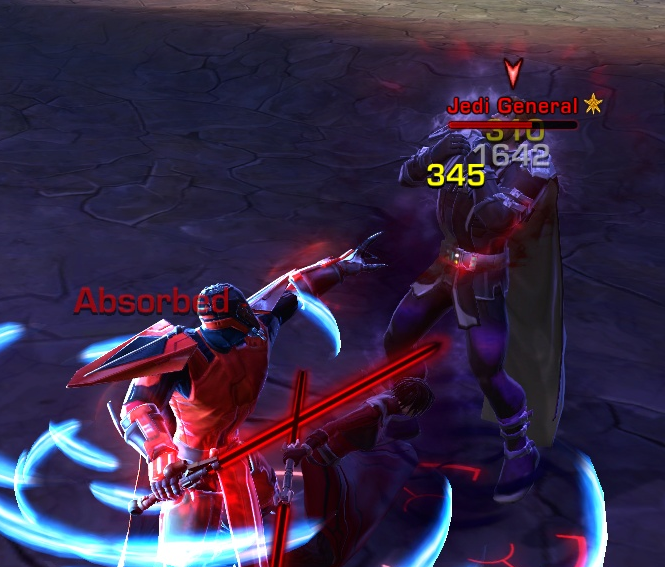 Like I mentioned in a previous post, I play Star Wars: The Old Republic, and I just had to share this screenshot with all none of you that visit my site. 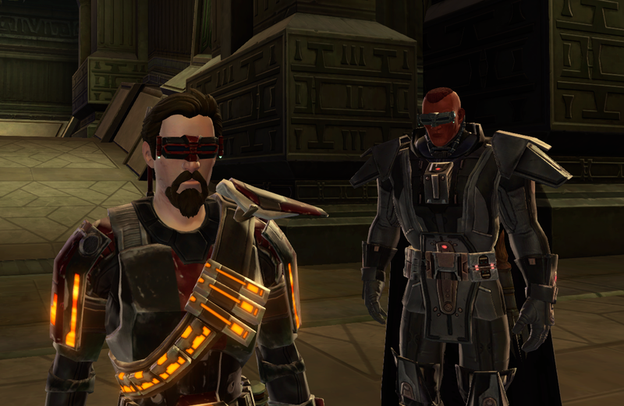 This is one of my main characters, a Jedi (on the left) and at this point in time he is running around with his companion that is a Sith Lord named Lord Scourge (on the right). The funny part of this thing is the eyewear that both toons have on. First of all the match, they are the same thing, which happened totally by accident. But also, the eyewear makes them look totally like futuristic Pimp Daddy’s!!! I am a Star Wars fan, as are many folk in the world. Plus, I even liked the prequel movies to some extent, no pure hatred there like so many people had. However, there is one thing I have wondered about, ever since I saw The Phantom Menace, because it was a pivotal part of the story. This pivotal part being the fight between Qui-gon, Obi-wan and Darth Maul. I want to know, what the heck are the pinkish/slightly red laser fences we’ll call them for lack of a better term that seem to arbitrarily (or not so arbitrarily maybe?) close and then open separating the fighters from each other? I ask because it was these “fences” that they had to travel through (and why did they have to travel through them?) that quite literally seems to have made the difference in the outcome of the fight because it split up Qui-gon and Obi-wan thus allowing Darth Maul to fight them one on one. Now, one on one, Darth Maul got the better of Qui-gon, however, it was then that Obi-wan took revenge, struck down Darth Maul, and ultimately walked away from the fight. If those stupid “laser fences” or “shields” or “doors” or whatever you want to call them hadn’t been there to separate the good guys from each other, the fight would have stayed two on one and Qui-gon might have lived through the fight. So, what the heck are those things??? If anyone knows, please comment and let me know! Thanks.